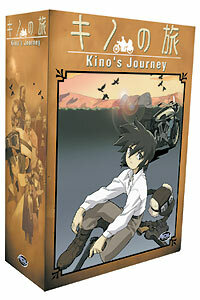 Contains DVD Volume 1 of Kino's Journey along with a stylish Art Box to hold the remaining releases for the show! Destination is a state of mind. Travelers not only find themselves in a variety of locations and geographic phenomena, but they also bear witness to the whims of culture and the skewed effects of subtle circumstance. Kino is such a traveler who travels the world on Hermes, a talking motorcycle, spending no more and no less than three days at each stop. Throughout their travels, Kino and Hermes are observers of new cultures, witness to both the differences and the similarities of peoples around the world. DVD Features: clean opening and closing animation, production sketches, and previews.